Police officers were seen as key members of local communities, expected to have knowledge of the people in their local area, as well as being able to effectively communicate official information amongst the community. 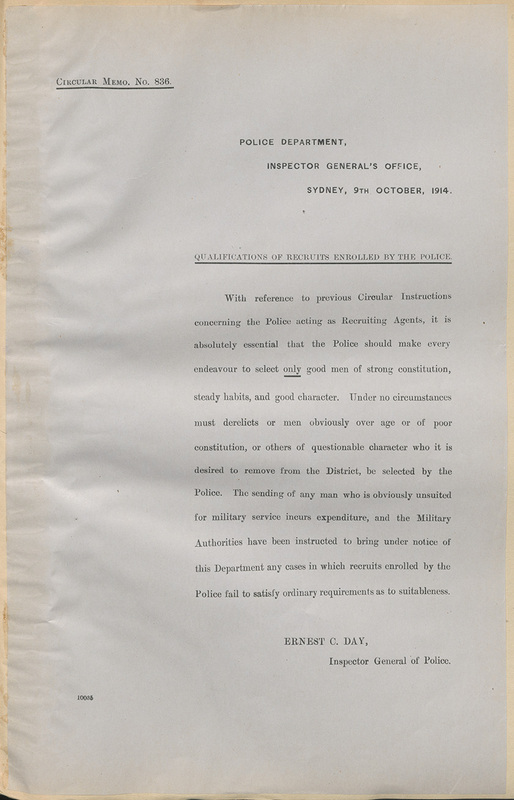 On 26 August 1914, New South Wales Premier, William Holman, suggested to Prime Minister, Joseph Cook, that the NSW Police Force act as the state-wide recruitment agent for a second contingent, in co-operation with Australian Army Medical Corps (AAMC) medical officers to carry out examinations of candidates. Despite his preference for mayors and presidents of shires for the task, the Minister for Defence approved Holman’s offer on 10 September 1914. 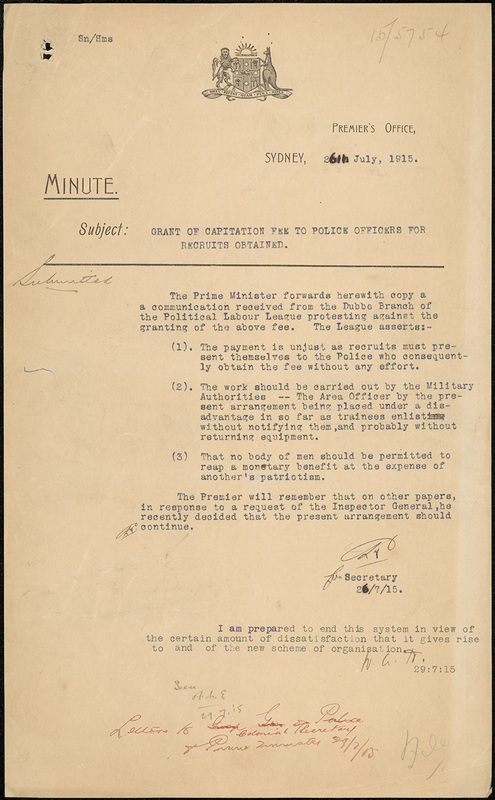 Implementing the plan began on 24 September 1914, ten days after the federal government had changed, with Andrew Fisher becoming Prime Minister, and Senator George Foster Pearce the Minister for Defence. 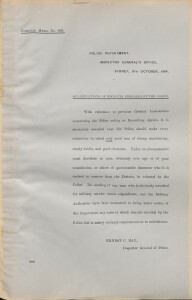 In late September 1914, kits including posters [Fig. 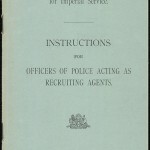 1], ‘Instructions for Officers of Police Acting as Recruiting Agents’ booklets [Fig. 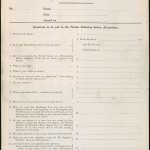 2], and attestation forms [Fig. 3], along with a circular letter of instructions [Fig. 4], were sent to NSW police stations. 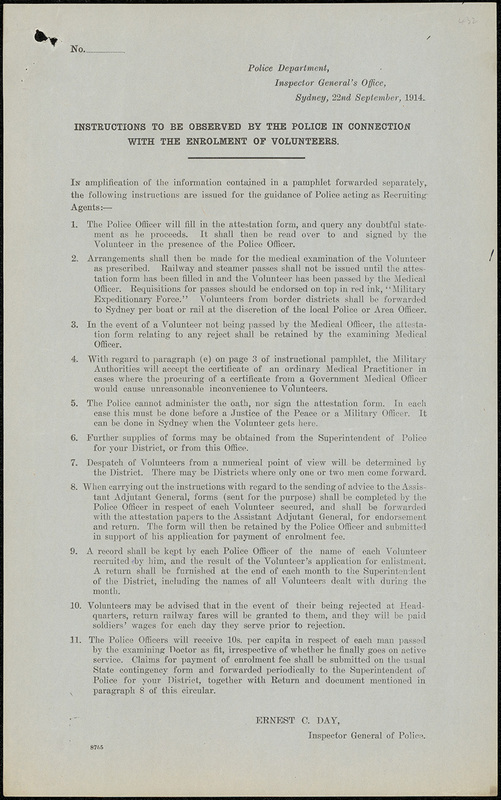 A ‘capitation fee’ of ten shillings was offered to police officers for each volunteer recruit accepted into the expeditionary forces, applied for via forms completed for each successful enlistment [Fig. 5]. The enrolment offices were open 9am-12pm Monday to Friday, and 9-11am on Saturdays, during which volunteers were also inoculated against Smallpox and Enteric Fever. 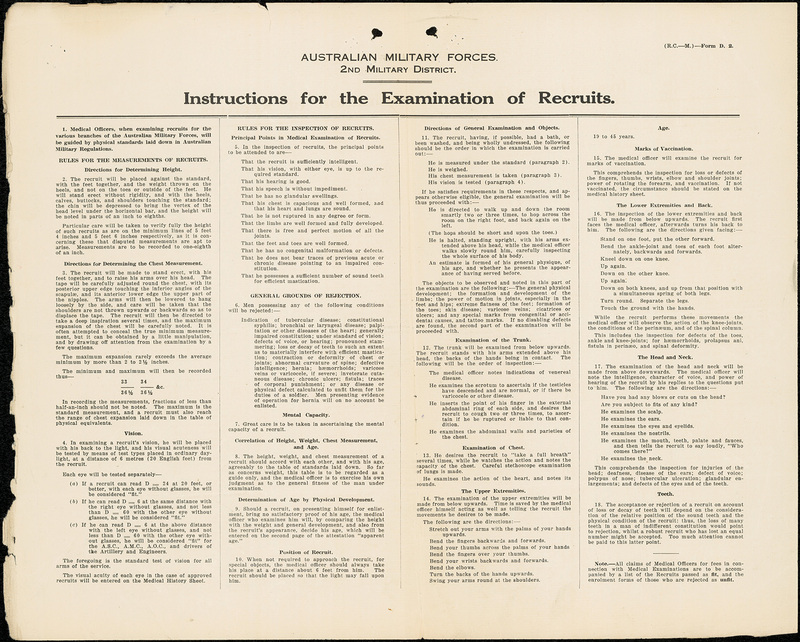 The initial requirements for all recruits were strict [see Fig. 6] and sought to have the highest calibre troops accepted, including requiring all men to be within the ages of 18-45, a minimum height of 5 feet, 4 inches, and to be ‘good rifle shots’. Single men were specifically prioritised in October 1914 and the minimum height was reduced to 5’ 3” in June 1915. 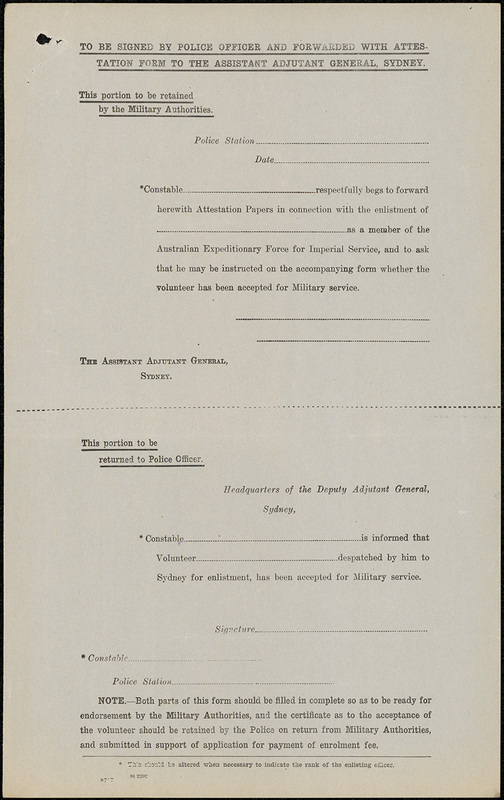 Once examined, recruits were then given railway passes and sent to Sydney by train where they were given a final assessment and enlistment at the military headquarters, Victoria Barracks, Paddington. 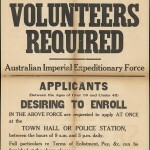 There were cases of recruits being forwarded to Sydney who did not meet the requirements [Fig. 7], including some said to be ‘friends of the police’; however these incidents when reported were swiftly acted upon. The federal military authorities spoke very highly of country NSW recruits in particular, noting their physical superiority to those from suburban locations, as well as their associated good horsemanship and rifle skills. This model operated state-wide, except for those towns close to interstate borders falling into other military districts, such as Broken Hill (4th Military District), and Northern Rivers District (1st Military District). 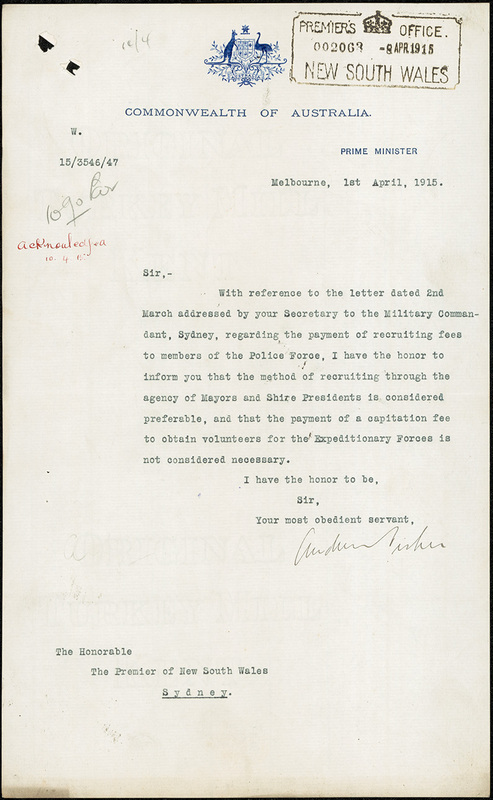 The Sydney Metropolitan and Newcastle Districts handed the work back to the military from 9 December 1914. 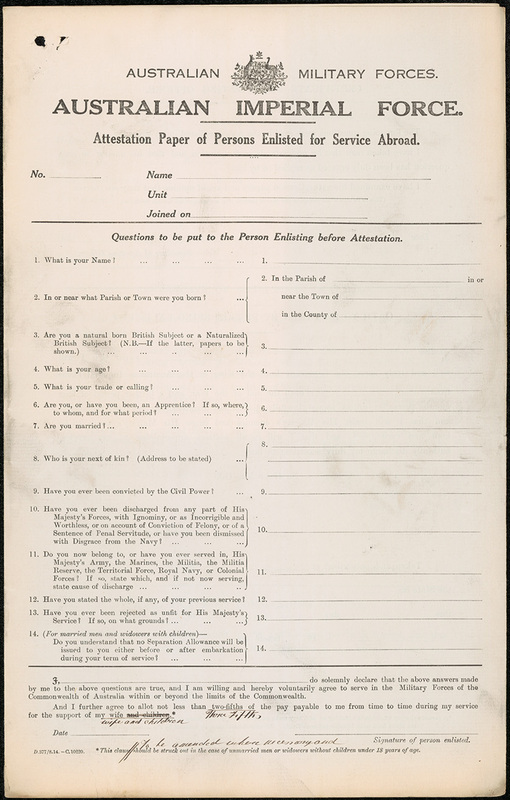 In late July 1915, Military Recruiting Depots were established in the rural centres of Armidale, Cootamundra, Dubbo, Goulburn, Lithgow, Narrabri, and Newcastle. 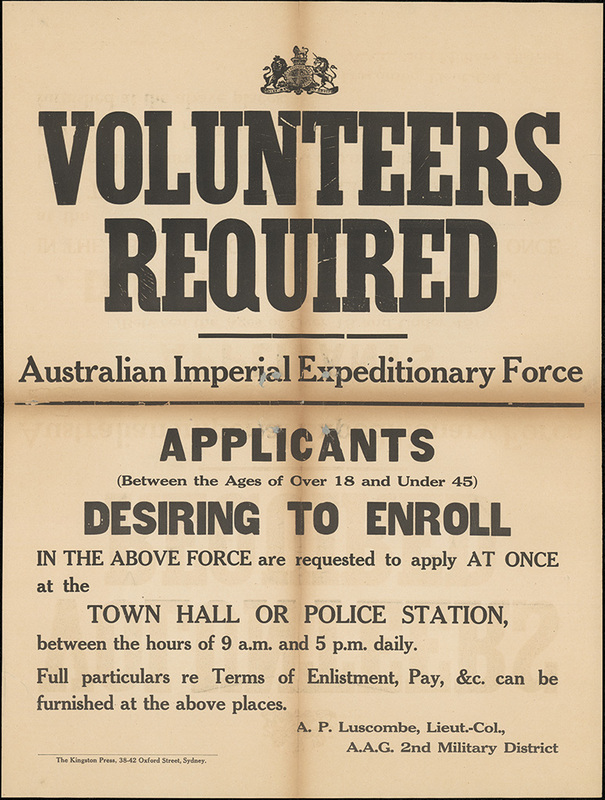 Recruits near to these towns were then sent to the corresponding depots for enlistment, instead of Sydney. 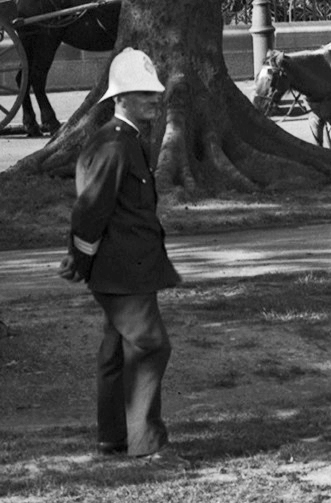 The reward of 10 shillings offered to police officers was considered unnecessary by some in the Police Force [Fig. 8] and members of the public, as well as by Prime Minister Fisher [Fig. 9]. One point of view was that the police should not “reap a monetary benefit at the expense of another’s patriotism” [Fig. 10]; that it was a police officer’s duty to do what they could to assist the Empire. 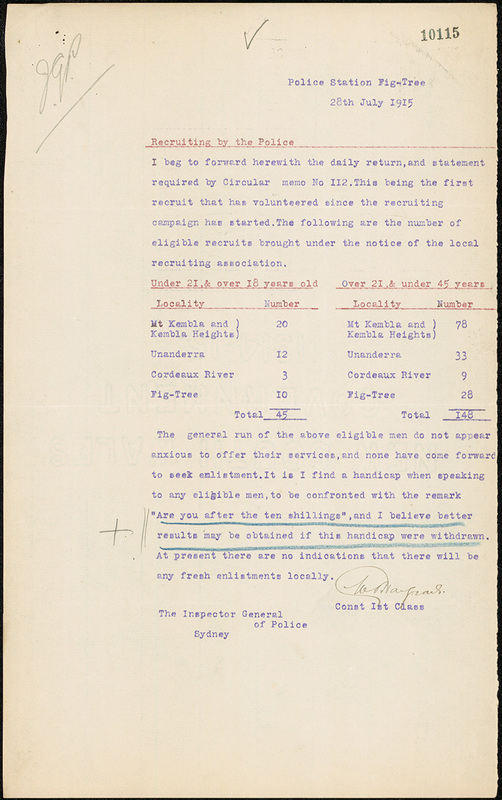 Another view demonstrated by some eligible men when encouraged to enlist, was to ask the police officer if he was “after the ten shillings” [Fig. 11]. Some in the Police Force who disapproved of the payment, either refused to receive it or passed it directly on to patriotic funds. 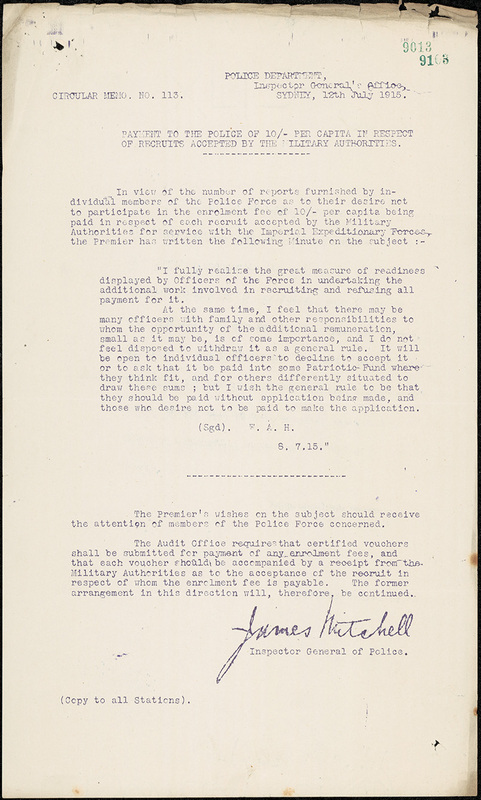 In mid-July 1915 Premier Holman communicated his decision to maintain the payment to those who needed it [Fig. 12]. 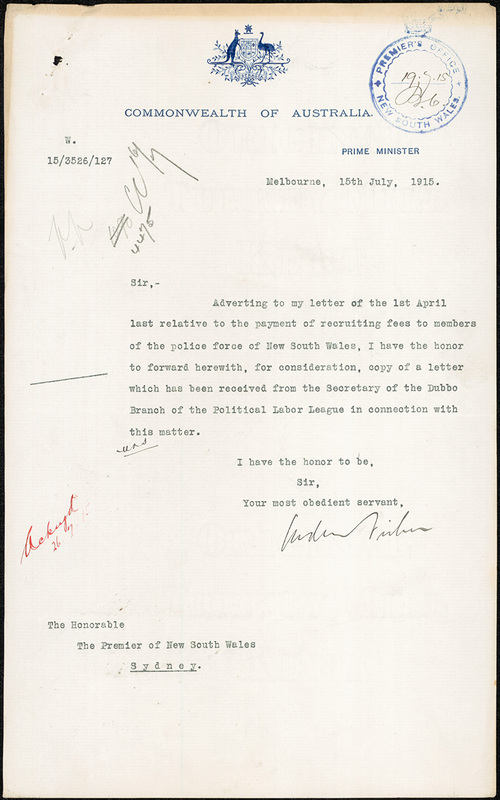 In response to this, the Premier received letters from several police stations declining payment of the fee, as well as one from Prime Minister Fisher forwarding a protest letter from the Dubbo Political Labor League [Fig. 13]. 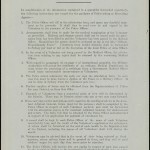 On 29 July 1915 Premier Holman agreed to have the fee discontinued in view of the amount of protest and the coinciding implementation of a revised recruitment scheme [Fig. 10]. The total amount rewards of this kind paid to Police officers up to this point had been £483,  which equates to 966 payments of 10 shillings – at minimum, almost 1000 volunteers had been signed up by the NSW Police as part of this system. 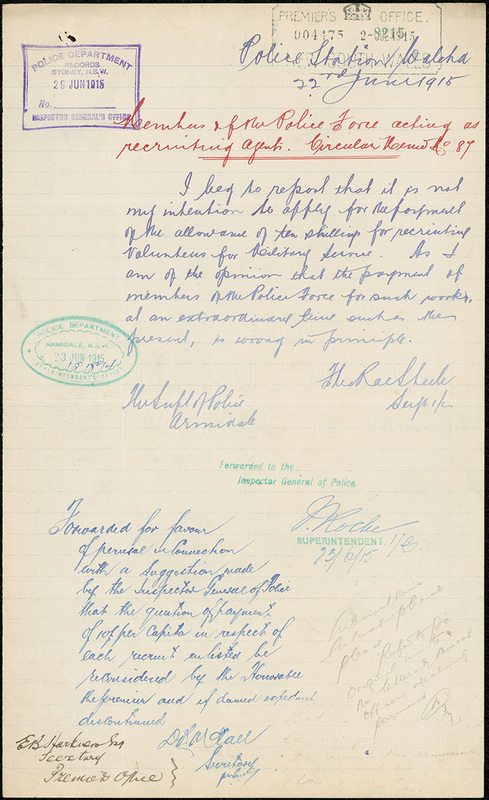 State Archives NSW: Police Department; NRS 10929, Copies of Circulars, Memoranda and circular memoranda sent; [7/6188] Circular Memo No. 323. 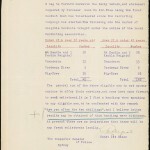 SANSW: Premier’s Department; NRS 12060, Letters received, 1907-1976; [9/4702] 15/4475. NRS 12060; [9/4702] 15/4475 enclosing 14/5944. NRS 12060; [9/4702] 15/4475 enclosing 14/5789. 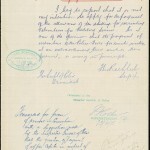 NRS 10929; [7/6187] Circular Memo No. 829. NRS 12060; [9/4702] 15/4475 enclosing 14/17309. 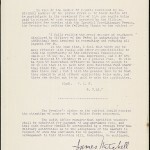 NRS 10929; [7/6187] Circular Memo No. 899. 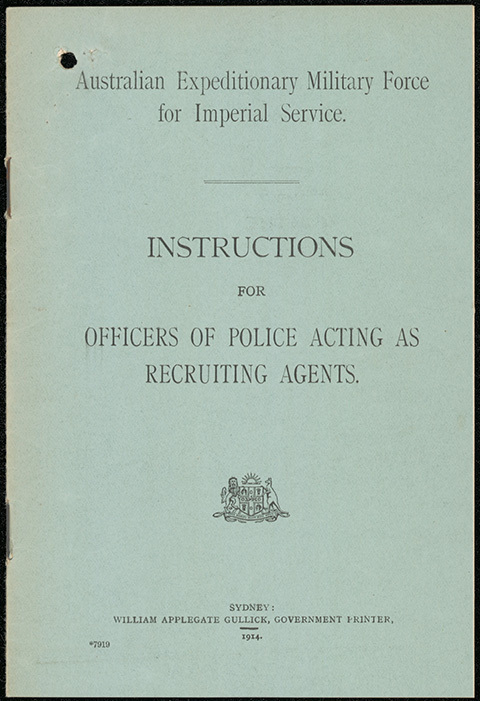 NRS 12060; [9/4702] 15/4475 enclosing ‘Instructions for Officers of Police Acting as Recruiting Agents’, p. 3. 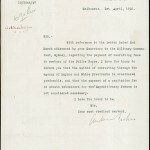 NRS 10929; [7/6187] Circular Memo No. 846. 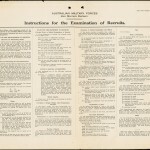 NRS 10929; [7/6187] Circular Memo No. 82. 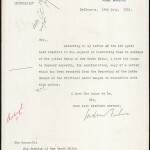 NRS 10929; [ 7/6187] Circular Memo No. 872. NRS 12060; [9/4702] 15/4475 enclosing 14/6792. NRS 12060; [9/4702] 15/4475, enclosing 14/7341. 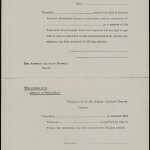 NRS 10929; [7/6187] Circular Memo No. 120. NRS 12060; [9/4702] 15/4475 enclosing 15/2063. NRS 12060; [9/4702] 15/4475 enclosing Police Department Circular Memo No. 113. 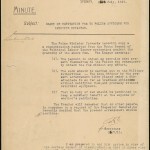 NRS 10929; [7/6187] Circular Memo No. 131. NRS 12060; [9/4732] B16/1666, p. 3.